Jun. 29, 2017 5:00 p.m.
NDP leader John Horgan will be B.C.’s next premier. Lt. Gov. Judith Guichon has asked Horgan to form the province’s government, ending 16 years of B.C. Liberal rule. The combined forces of the B.C. NDP and Greens defeated the Liberal government and leader Christy Clark in a vote of non-confidence in the B.C. legislature Thursday afternoon. Outside Government House in Victoria, Horgan said he’s ready to get to work. “I’m excited,” he said. “Now, seven weeks after the election we can get going on a government that works for the people,” he said. After a long day of guiding the confidence vote through and waiting for a decision, Horgan said his first priority was to get a bite to eat and get some rest. The next is to begin building a new government and choosing a new cabinet for the first change of political leadership in 16 years. Horgan said he told Guichon he can maintain the confidence of the legislature, with 44 seats for the NDP and Greens to 43 B.C. Liberals. Immediately after the legislature adjourned Thursday following the vote of non-confidence, B.C. Liberal Speaker Steve Thomson resigned the position, forcing the NDP to nominate one of their MLAs when the legislature resumes. 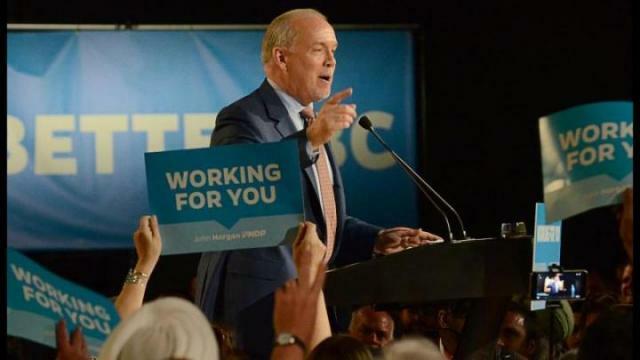 Horgan has estimated that it could take the rest of the summer to go through government transition documents, meet with deputy ministers, and review Crown corporations such as BC Hydro and ICBC. The legislature may not be called for delivery of a new throne speech until after Labour Day, he said. Clark said in her discussion with Guichon, she was asked to choose between two options, handing over power to the NDP-Green alliance or dissolving the parliament and going to a new election. NDP house leader Mike Farnworth said in an interview Thursday he is confident that even after appointing a speaker from the NDP bench, leaving 43 MLAs on each side, the alliance of NDP and Green MLAs can pass legislation. Rules of the legislature allow the speaker to vote only in the event of a tie, and the speaker is restricted to voting for further debate or to support the government. Legislation can be introduced and moved to committee, where the NDP and Greens would have a majority, and only brought back to the main chamber for a final vote where the tie would be broken by the NDP speaker voting in favour, Farnworth said.